What the Hell Happened to...Vitaly Potapenko? He was the number 12 overall pick in one of the best NBA drafts of all time. 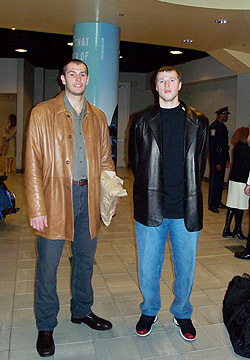 Along with Zyndrunas Illgauskas, they were both first round picks that season for the Cleveland Cavs. He took a lot of grief from fans when he was acquired for the pick that turned into Andre Miller the next season. You probably remember the "Ukraine Train," Vitaly Potapenko. Potapenko came from Wright State University, one of only two players to make the NBA from Wright State (by the way, check out this other guy Bill Edwards. Look at that shooting percentage, both from the field and on free throws! I'm astonished he didn't last longer than 3 games ;-). Vitaly would play his first 2.5 seasons in Cleveland before being acquired by the Celtics for Andrew DeClercq and their first round pick (which became Miller). He'd go on to play 3.5 years for the Celtics. His first year and a half, he primarily started while his last 2 seasons he'd come off the bench. On the 2002 Celtics team that overachieved, he'd play 79 games and start 7, averaging about 17 minutes a night with 4.5 points and 4 rebounds. That next summer he was dealt along with Kenny Anderson and the corpse of Joe Forte for Vin Baker and Shammond Williams. Vitaly never went on to play more than 65 games in a year after that 02 campaign with the C's. 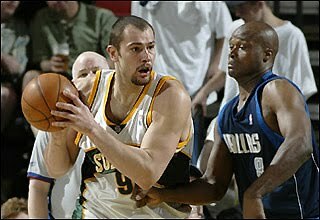 He'd wind up playing 3 seasons in total with the Sonics before being dealt to the Kings in a 4 team deal in 2006. Despite being with the Kings for 2006 and 2007, he'd only play in 12 games for them. At the time I was happy with the trade to Boston. I remember scouring NBA rosters and looking to see which guy I thought would solidify the front line and give the Celtics an interior presence. He was the one guy I thought could really help. In hindsight, I wish there was a way that pick could've been lottery-protected. Andre Miller's always been a guy I wanted to play for the Celtics. 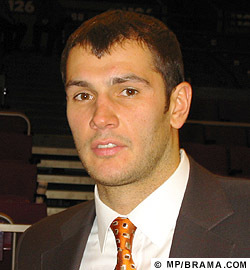 Today, in the likeness of Jay Humphries, Potapenko is in the D League, as an Assistant Coach with the Fort Wayne Mad Ants. After retiring from the Spanish team MMT Estudiantes, Vitaly coached a bit at his old high school in Florida before having Jim O'Brien get him connected with the NBDL. For an interview with Potapenko from February 16th of this year, you can click here. It's actually somewhat informative as Vitaly said he retired because his knees hurt too much and he also speaks about newest Celtic Oliver Lafayette and ex-Celtic Dan Dickau (both of whom were affiliated with the Mad Ants). Later on in the interview, the interviewer talks with Vitaly about sounding a lot like Arnold Schwarzenegger. Then Vitaly does his impression of Arnold, which is pretty entertaining and spot-on. ADDENDUM**- As of 12/19/2010, Jim O'Brien hooked up Potapenko even further- he is now an assistant coach with the Pacers. First time I can think of a European guy becoming an NBA Assistant coach actually after his playing career is over. But that doesn't mean they can't still teach guys skills lol. I actually liked the Ukraine Train in Cleveland and thought he'd be a better Celtic. That's cool that he's a D-League coach. i guess I assumed that he went back to the Ukraine after he retired. How about Los Suns with Los sweep? And don't try to sneak white space by me at 2 AM! lol. Man I don't think I've ever left 3 straight comments on a post. Might as well make it 4. Potapenko looks like John Locke (from Lost) in the Sacto pic. I remember him. Why did we trade him? He was good. Enjoying your blog. Keep posting! I was hoping you'd do one on Potapenko. Nice job. Potapenko was a good player. He may have been a little overrated in some periods but he worked and did his job very decently. Ukranian train!! Thanks Bohemian. I actually always thought he would've been better than he was. I figured he could've been a 16 & 9 guy.